A trio of gents shared the same physical endowment: Forrest Tucker, Milton Berle and Victor Mature. One would think there would be at least a TV series in that. Was it just me or did he actually seem to remember less and less as the interview went on? So much more I wanted to see covered, but I take it the interview was cut short because Larry was clamming up. I would have loved to hear about his experience on MARRIED..WITH CHILDREN, the last thing I saw him in. Great reading and thanks for this entry. I have always a fan of Mr. Storch and often wondered about his past work. He seldom shares it with his fans. I hope me is doing well and he is one of those icons of another 'classier' era of stage and TV. God bless him. I have 'fav' this blog will explore it more in future. Could you tell me when Mr. Storch was born and where? So great to see Mr. Storch interviewed for your wonderful site, Kliph. I had the privilege of meeting him in August 2000 while he was touring with ANNIE GET YOUR GUN (a few months later he was in the Broadway version). I recall him having an excellent memory regarding the memorabilia I had with me (including a 1969 TV magazine for his short-lived THE QUEEN AND I series). 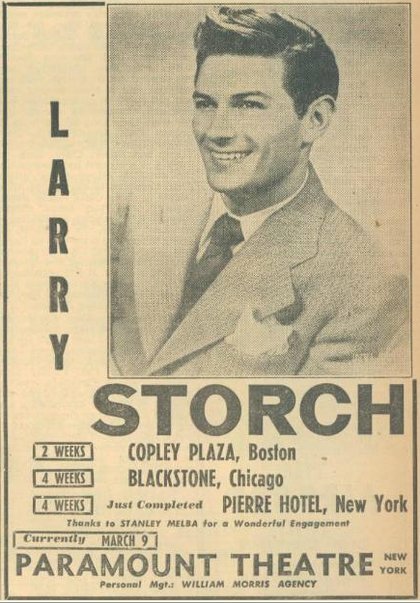 Here's hoping Larry is up for a Part Two sometime; he guest starred on practically every comedy from the early Sixties to the mid Eighties and has to have a lot of great stories to tell. I'm sorry, is this where I can get S.N. Behrman's autograph and a half-price program for the light opera being performed in Branson MO? 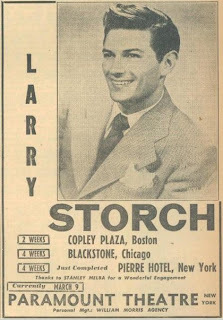 Seriously, Larry Storch has been one of the great comedians. How we loved "F Troop"! I'm sorry I missed so much of the rest of his career. Good luck, Larry. You're THE BEST.